August Wolf, in a red cap inspired by Donald J. Trump, sought signatures from diners at the Prescott Bush dinner last month. The political adventure of former Olympic shot putter August Wolf ended in failure Tuesday, marked by an email acknowledging he lacks the signatures to force a Republican primary for U.S. Senate, leaving state Rep. Dan Carter as the GOP’s uncontested choice to oppose U.S. Sen. Richard Blumenthal, a Democrat. Wolf exits the race after an unlucky 13 months as a first-time candidate for office. The publicity the Stamford businessman’s campaign generated largely was unwanted, much of it detailing a series of staff defections, firings and litigation that caused the GOP establishment to all but beg Carter to seek the nomination. 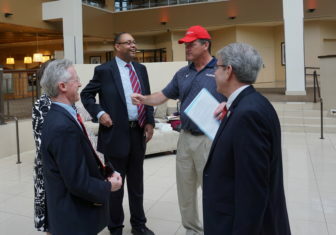 Delegates to the Republican state convention embraced Carter, a candidate for little more than a month, and rejected Wolf. After a series of first-ballot vote switches, standard fare at Democratic and GOP endorsement conventions, Wolf fell short of the 15 percent convention vote to automatically qualify for a primary. 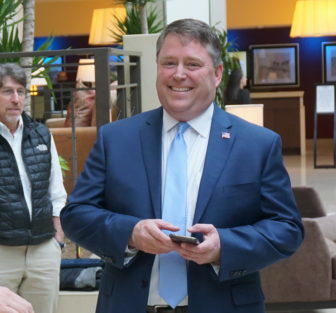 To force a primary on Aug. 9, Wolf had to gather the signatures of 8,079 registered Republicans, a number equal to 2 percent of the GOP registration in Connecticut. The deadline was 4 p.m. on June 7. He quit the race before the secretary of the state’s office announced a final tally. “As of today, the secretary of the state’s office had accepted 5,280 signatures,” said Patrick Gallahue, a spokesman for the office. The petitions are filed with local registrars, who certify or reject them, then forward them to the secretary of the state’s office. Among the places where Wolf tried to gather signatures was the GOP’s annual fundraiser, the Prescott Bush Awards Dinner. His campaign workers asked Carter to sign as he and his fiancee arrived. They laughed and posed for pictures, but declined to share their signatures. Wolf supplied his own theater, albeit with talking points scripted by others. A former campaign fundraiser claimed in a lawsuit recently that Wolf violated election laws, created a hostile work environment with explicit sexual banter, and reneged on a $50,000 compensation deal. Samantha Menh was the latest former aide to allege a frat-boy atmosphere in the campaign. Dan Carter was amused when a Wolf campaign worker suggested he sign a petition. Her lawsuit extensively quoted a long passage from a CT Mirror article about the campaign’s troubles as the factors that caused her to demand a $50,000 guarantee for signing on with Wolf. Wolf mentioned none of those difficulties Tuesday, only the challenges faced by an outsider trying to gain the GOP nomination for statewide office. He ended with an offer of support for Carter, a three-term state representative from Bethel.